Solve an Eikonal equation using Fast Marching. Fast marching solves an Eikonal equation where the speed is always non-negative and depends on the position only. Starting from an initial position on the front, fast marching systematically moves the front forward one grid point at a time. Updates are preformed using an entropy satisfy scheme where only "upwind" neighborhoods are used. This implementation of Fast Marching uses a std::priority_queue to locate the next proper grid position to update. Fast Marching sweeps through N grid points in (N log N) steps to obtain the arrival time value as the front propagates through the grid. Implementation of this class is based on Chapter 8 of "Level Set Methods and Fast Marching Methods", J.A. Sethian, Cambridge Press, Second edition, 1999. This class is templated over the level set image type and the speed image type. The initial front is specified by two containers: one containing the known points and one containing the trial points. Alive points are those that are already part of the object, and trial points are considered for inclusion. In order for the filter to evolve, at least some trial points must be specified. These can for instance be specified as the layer of pixels around the alive points. The speed function can be specified as a speed image or a speed constant. The speed image is set using the method SetInput(). If the speed image is NULL, a constant speed function is used and is specified using method the SetSpeedConstant(). If the speed function is constant and of value one, fast marching results in an approximate distance function from the initial alive points. FastMarchingImageFilter is used in the ReinitializeLevelSetImageFilter object to create a signed distance function from the zero level set. The algorithm can be terminated early by setting an appropriate stopping value. The algorithm terminates when the current arrival time being processed is greater than the stopping value. There are two ways to specify the output image information ( LargestPossibleRegion, Spacing, Origin): (a) it is copied directly from the input speed image or (b) it is specified by the user. Default values are used if the user does not specify all the information. The output information is computed as follows. If the speed image is NULL or if the OverrideOutputInformation is set to true, the output information is set from user specified parameters. These parameters can be specified using methods SetOutputRegion(), SetOutputSpacing() and SetOutputOrigin(). Else if the speed image is not NULL, the output information is copied from the input speed image. Possible Improvements: In the current implemenation, std::priority_queue only allows taking nodes out from the front and putting nodes in from the back. To update a value already on the heap, a new node is added to the heap. The defunct old node is left on the heap. When it is removed from the top, it will be recognized as invalid and not used. Future implementations can implement the heap in a different way allowing the values to be updated. This will generally require some sift-up and sift-down functions and an image of back-pointers going from the image to heap in order to locate the node which is to be updated. Definition at line 104 of file itkFastMarchingImageFilter.h. Reimplemented from itk::ImageToImageFilter< TSpeedImage, TLevelSet >. Reimplemented in itk::FastMarchingExtensionImageFilter< TLevelSet, TAuxValue, VAuxDimension, TSpeedImage >, and itk::FastMarchingUpwindGradientImageFilter< TLevelSet, TSpeedImage >. Definition at line 112 of file itkFastMarchingImageFilter.h. Definition at line 159 of file itkFastMarchingImageFilter.h. Definition at line 84 of file itkImageToImageFilter.h. Definition at line 83 of file itkImageToImageFilter.h. Definition at line 82 of file itkImageToImageFilter.h. Definition at line 171 of file itkFastMarchingImageFilter.h. 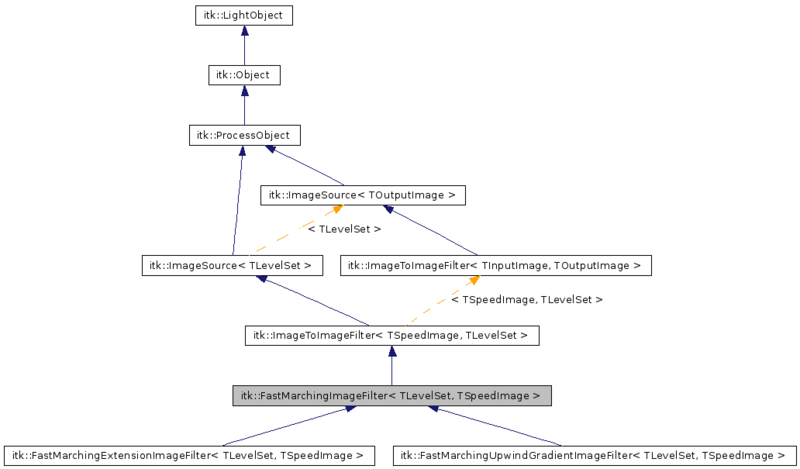 Reimplemented in itk::FastMarchingUpwindGradientImageFilter< TLevelSet, TSpeedImage >. Definition at line 168 of file itkFastMarchingImageFilter.h. Definition at line 122 of file itkFastMarchingImageFilter.h. Definition at line 316 of file itkFastMarchingImageFilter.h. Definition at line 123 of file itkFastMarchingImageFilter.h. Definition at line 118 of file itkFastMarchingImageFilter.h. Definition at line 126 of file itkFastMarchingImageFilter.h. Definition at line 127 of file itkFastMarchingImageFilter.h. Definition at line 125 of file itkFastMarchingImageFilter.h. Reimplemented from itk::ImageSource< TLevelSet >. Definition at line 69 of file itkImageSource.h. Definition at line 75 of file itkImageToImageFilter.h. Definition at line 65 of file itkImageSource.h. Definition at line 131 of file itkFastMarchingImageFilter.h. Definition at line 129 of file itkFastMarchingImageFilter.h. Definition at line 128 of file itkFastMarchingImageFilter.h. Definition at line 130 of file itkFastMarchingImageFilter.h. Definition at line 124 of file itkFastMarchingImageFilter.h. Definition at line 111 of file itkFastMarchingImageFilter.h. Definition at line 109 of file itkFastMarchingImageFilter.h. Definition at line 149 of file itkFastMarchingImageFilter.h. Definition at line 148 of file itkFastMarchingImageFilter.h. Definition at line 145 of file itkFastMarchingImageFilter.h. Definition at line 110 of file itkFastMarchingImageFilter.h. Enum of Fast Marching algorithm point types. FarPoints represent far away points; TrialPoints represent points within a narrowband of the propagating front; and AlivePoints represent points which have already been processed. Definition at line 165 of file itkFastMarchingImageFilter.h. Definition at line 289 of file itkFastMarchingImageFilter.h. Reimplemented in itk::FastMarchingExtensionImageFilter< TLevelSet, TAuxValue, VAuxDimension, TSpeedImage >. Generate the output image meta information. Get the container of Alive Points representing the initial front. Definition at line 183 of file itkFastMarchingImageFilter.h. Get thConste Collect Points flag. Get the point type label image. Definition at line 200 of file itkFastMarchingImageFilter.h. Get Large Value. This value is used to represent the concept of infinity for the time assigned to pixels that have not been visited. This value is set by default to half the max() of the pixel type used to represent the time-crossing map. Definition at line 299 of file itkFastMarchingImageFilter.h. Definition at line 260 of file itkFastMarchingImageFilter.h. Get the container of Processed Points. If the CollectPoints flag is set, the algorithm collects a container of all processed nodes. This is useful for defining creating Narrowbands for level set algorithms that supports narrow banding. Definition at line 248 of file itkFastMarchingImageFilter.h. Get the Fast Marching algorithm Stopping Value. Get the container of Trial Points representing the initial front. Definition at line 196 of file itkFastMarchingImageFilter.h. Dimension of the level set and the speed image. Set the container of Alive Points representing the initial front. Alive points are represented as a VectorContainer of LevelSetNodes. Definition at line 175 of file itkFastMarchingImageFilter.h. Set the Collect Points flag. Instrument the algorithm to collect a container of all nodes which it has visited. Useful for creating Narrowbands for level set algorithms that supports narrow banding. Set/Get the Normalization Factor for the Speed Image. The values in the Speed Image is divided by this factor. This allows the use of images with integer pixel types to represent the speed. The output largeset possible, spacing and origin is computed as follows. If the speed image is NULL or if the OverrideOutputInformation is true, the output information is set from user specified parameters. These parameters can be specified using methods SetOutputRegion(), SetOutputSpacing() and SetOutputOrigin(). Else if the speed image is not NULL, the output information is copied from the input speed image. Definition at line 258 of file itkFastMarchingImageFilter.h. Set the Speed Constant. If the Speed Image is NULL, the SpeedConstant value is used for the whole level set. By default, the SpeedConstant is set to 1.0. Definition at line 206 of file itkFastMarchingImageFilter.h. Set the Fast Marching algorithm Stopping Value. The Fast Marching algorithm is terminated when the value of the smallest trial point is greater than the stopping value. Set the container of Trial Points representing the initial front. Trial points are represented as a VectorContainer of LevelSetNodes. Definition at line 188 of file itkFastMarchingImageFilter.h. Definition at line 313 of file itkFastMarchingImageFilter.h. Definition at line 318 of file itkFastMarchingImageFilter.h. Definition at line 317 of file itkFastMarchingImageFilter.h.